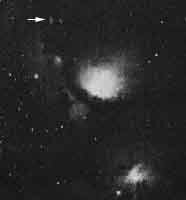 Julian W. (Jay) McNeil, Paducah, KY reported of a presumably new nebula in February 2004 (McNeil 2004). This nebula, which he discovered on CCD images taken with a 7.6-cm refractor on January 23, 2004, could not be recognized in seven photographic plates taken between 1951 and 1991 for the Digital Sky Survey, or on images taken about three months earlier. While discovering the visual emerging, or outburst, and thus the variability of this object, Jay McNeil was not aware that this nebula is well visible in other older images, such as the the image in our M78 object page (by Evered Kreimer, taken in October 1966) - of which we learned from a number of attentive readers. On the right, the part of this M78 image showing McNeil's Nebula is cropped; the object is clearly visible in the upper half of this crop, near the double star and above (south of) the nebula NGC 2064. Parts of M78 are visible in the lower right. This object had not been previously cataloged as a visual object. The nebula measures about 78x57" (1.3x0.95'). The object is obviously a variable nebula, i.e. a reflection nebula illuminated by a variable star of some kind, or with the star's light being variably obscured for some reason. It is apparently associated with the infrared source IRAS 05436-0007. Remarkably, this object has experienced rapid changes in the visible light, from being virtually invisible less than three months earlier to one of the more conspicuous objects in this field. Very probably, this object was generated by a very young "stellar" object during its process of formation, which is presently undergoing an eruption. While this should be a quite common event in star forming regions, yet only very few of these eruptions have ever been captured in such an early state as this one. Jay McNeil points out (in private communication) that such eruptions, sometimes referred to as FU Orionis or EX Lupii type events, always occur considerably rapid, but this varies: FU Orionis rose from mag 16 to 10 in just e few months, while V1515 Cyg took several decades to increase by only 4 mags. The reappearance of this nebula supports a speculation by Reipurth, Herbig, and others that such pre-main sequence eruptions may be periodic, or at least recurrent in nature; however, at this stage, nothing is known about the relevant periods, or time intevals, between consecutive events. The Herbig-Haro object HH 22 is a jet emerging from a star situated well within the field of McNeil's Nebula, i.e., either superimposed in the same direction (just in front or behind), or within the nebula. This star co-incides with the bright dot in the magnification from the Kreimer image. The nebula itself appears to emerge from another "nucleus," probably a star, at its Southern end (upper in the Kreimer image). That latter star may co-incide with the infrared source IRAS 05436-0007; it has been designated V1647 Orionis. Both presumable stars appear at different brightness in various images, be it because they are variables (physical or occulted) of some kind, be it because of different spectral sensitivity of the images. See Michael Richmond's page for some examples. Gianluca Masi of the University of Rome "Tor Vergata" investigated this region immediately after he learned of the nebula discovery, with the robotic Tenagra II 32-inch reflector in Southern Arizona. During his investigations, he not only found a lot of interesting detail on the morphology of the nebula, but also discovered the variability of one of the neighboring stars, the southern partner of the nearby double. Note his report! 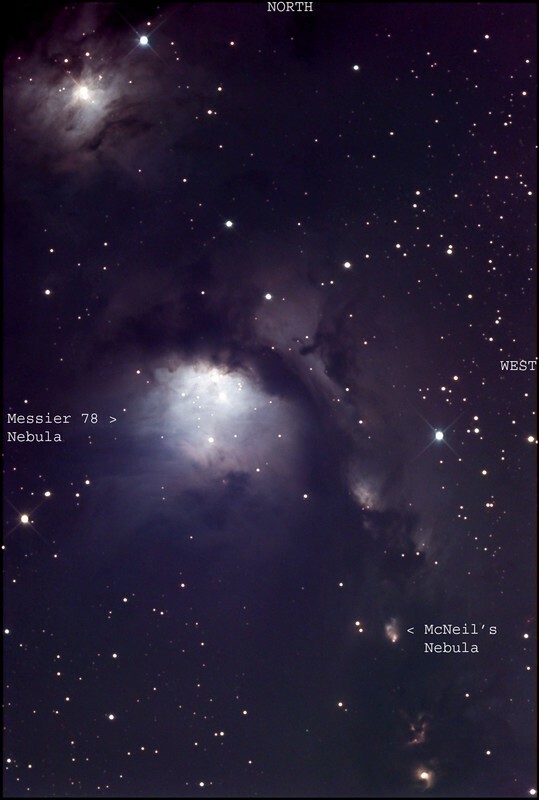 On the right, see an outstanding image by Jay McNeil of the M78 region, with the NcNeil Nebula obvious (note the reverse orientation as compared to our image). It was taken on February 15, 2004, and is an LRGB composite utilizing 200 minutes of luminace data combined with 20 minutes each RGB, taken through Jay's homemade 10-inch Newtonian at f/5.8 with ST-10XME. A labelled version of this image is available, identifying McNeil's Nebula. The "McNeil's Nebula" and a new variable star close to it, by Gianluca Masi, Physics Dept., University of Rome "Tor Vergata". Investigations of the nebula and discovery of a nearby variable star with the robotic Tenagra II 32-inch reflector in Arizona. A further account of his findings appeared in Masi (2004). McNeil Nebula, LRGB image taken by Adam Block (KPNO Visitor Center) with a 20-inch RC telescope operating at f/8.4 and SBIG ST10XME CCD camera.